ArtHamptons is back for its ninth run under blue skies refreshed by ocean breezes in Bridgehampton. This year, over 50 galleries om around the world gather under one tent on an exclusive Hamptons estate to share their treasures with visitors. The atmosphere is festive. The galleries are welcoming and happy to chat about their artists and work, and the art on display is as expansive and varied as the world they come from. 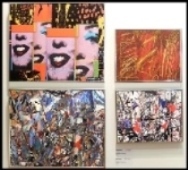 Able Fine Art NY Gallery with director, Michelle Yu and Jeon Nak's lenticular abstractions. Just past the entrance is Able Fine Art Gallery, with galleries in Chelsea, NY and Seoul, South Korea. Directors Michelle and Benjamin Yu have strong and wide-ranging tastes and sensibilities. 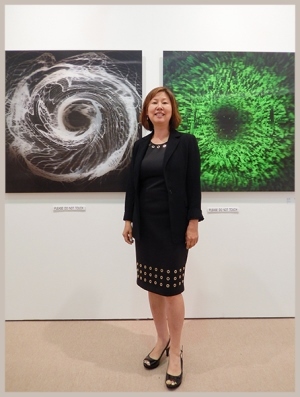 They've selected an exciting mix of Asian and American contemporary painters, sculptors and photographers. Photographer Adel Gorgy's work blends the conceptual with the visual as he reconstructs and recomposes works of earlier artists – here, Pollock, de Kooning, Twombly and Warhol – into stunning new compositions. Jeon Nak's dynamic, color saturated 3D prints pull the viewer in even as they seem to jump off the wall. KwanWoo Lee's multimedia portraits of the Buddha and others are created of hand crafted signature stamps. Marsha Solomon's ethereal color-field paintings employ intensely joyful tones mixed with gentle washes and masterful brushstrokes to evoke meditative states of mind. 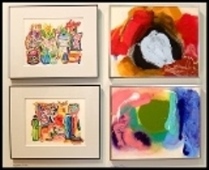 Marsha Solomon's lyrical acrylic and ink paintings and Adel Gorgy's photographs that challenge the boudaries between painting and photography Able Fine Art NY Gallery.